This is not a crafty related post! along with a place to share my passion for scrapbooking and card making. I feel it is a great resource in remembering your life and the life of your family! my sweet Dachshund Muffy to sleep. She was just one month shy of 15 years old. 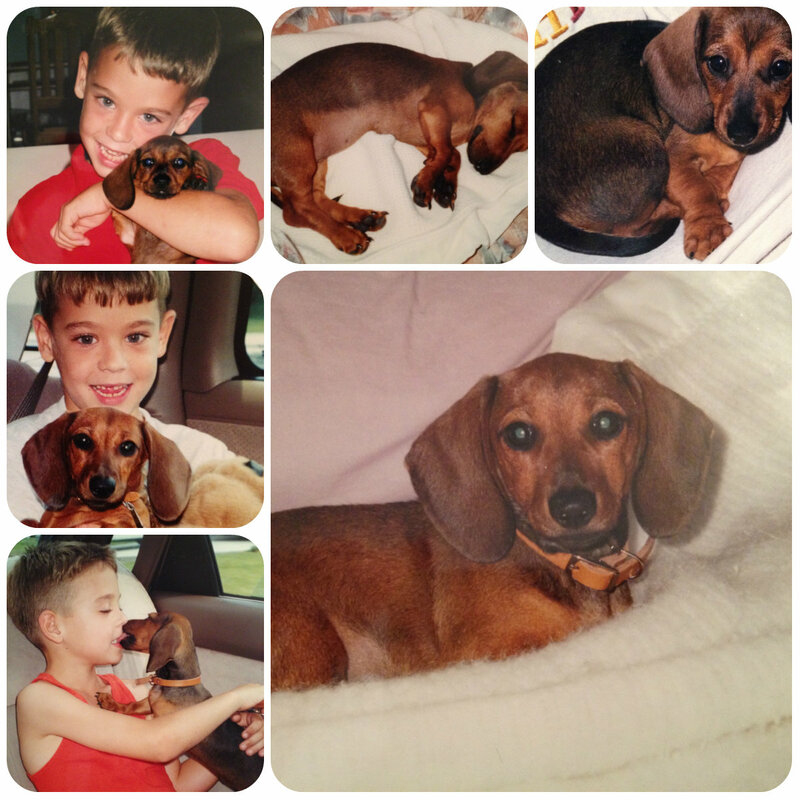 Here are a few photos that will reflect why she was the best pet a family could have ever asked for! Tyler picked out her name, because when she slept she curled up just like a Muffin. by the size of sticks she would fetch from the water at the beach. Muffy….. thanks for making our house a home! 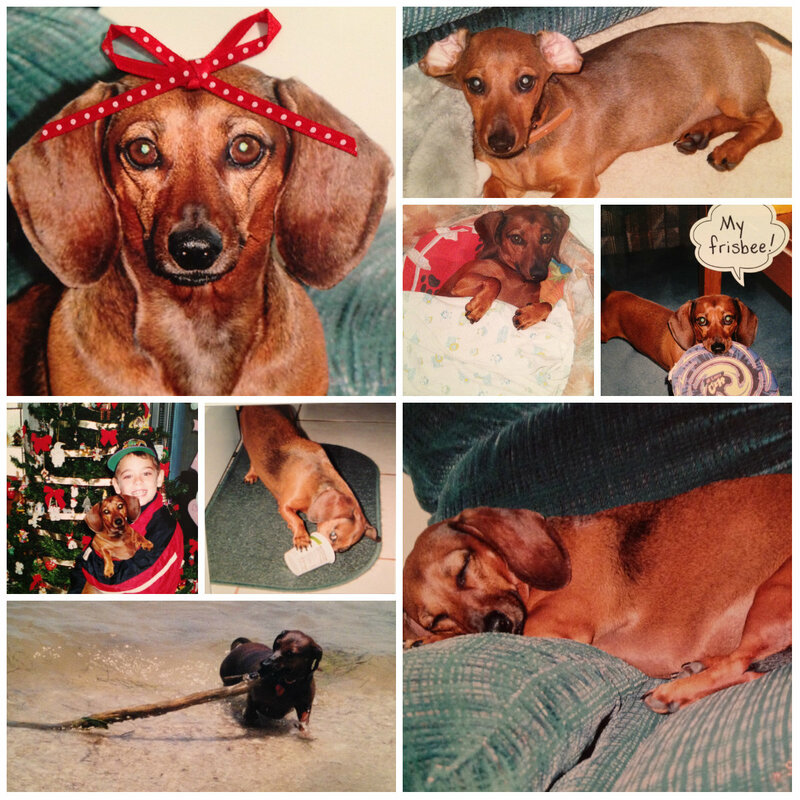 Categories: Family | Tags: Dachshund, dogs, loss of a pet | Permalink. Thanks Sue…I am doing better each day! Thanks Sue…I am really doing just fine! Just thought it would be nice to share how cute she was with the world! Take care! Yes that was Ty…I had a lot more I wanted to add but didn’t want to over do it. Hadn’t cried all day and now I can’t say that! :0 Thanks friend! Thanks Sharyn….I am really doing just fine…just wanted to reflect and remember her! HUGS! Nancy, so sorry about Muffy. My daughter had a Dachshund a little older than Muffy and she had to put her down few years ago. You are in my thoughts and prayers my friend. Thanks JoAnn…I am doing better and better each day and the tears only flow when I look at her photos. Guess I shouldn’t have made that post…lol! Thanks so much! Thanks Vicki….I am doing much better then I thought the first day was the roughest! My sympathy on the loss of your pet. And, what a cute little dog she was! I know how hard it is but you have some wonderful memories captured in photos so that you will always remember the love and comfort she brought into your life. Thanks so much Verna…I am doing much better now! I’m so sorry to hear of your loss Nancy. Love the pictures you shared…what a little cutie she was! One of our neighbors has a dachshund named Gretchen. We get such a kick out of watching her. She’s always sniffing out the critters in the neighborhood; I swear, if she could climb a tree…she would. Those squirrels just drive her nuts! Hi Susie, Yes dachshunds are the BEST! Mine could sniff and dig till the cows came home. Thanks for thinking of me! Thanks so much Sophia…I am doing better and better each day! HUGS! I am so so SORRY, Nancy, but knowing you, it was the right time and the right thing to do. Such Sweet photos of Ty and your darling Muffin. Thx for sharing! Thanks Sue…I am doing much better now! HUGS! Oh Nancy, I’m so sorry for your loss. She really looks just as sweet and can be. I’m glad you had a lot of years with her, but it’s never easy. My heart goes out to you and your family. Thank you for sharing your precious Muffy with us. God Bless! Sorry for your lose. That was a great tribute to the muffy.